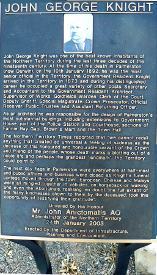 The John Knight Memorial plaque was unveiled in the Palmerston Cemetery in 2003 by the Administrator of the Northern Territory, Mr John Anictomatis AO. 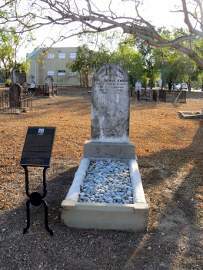 The grave and memorial plaque to John George Knight in the Pioneer (Palmerston) Cemetery, Goyder Rd Darwin. This cemetery was in use from 1865 until around 1920 for the original town of Palmerston, later renamed Darwin. John George Knight was one of the best known inhabitants of the Northern Territory during thelast threee decades of the nineteenth century. At the time of his death in Palmerston 9now Darwin) on the 10th of January 1892 he was the most senior official in the Territory, the Government Resident. Knight arrived in the Territory in 1873 and during his distinguished career he occupied a great variety of other posts: Secretary and Accountant to the Government Resident, Architect, Supervisor of Works, Goldfields Warden, Clerk of the Court, Deputy Sheriff, Special Magistrate, Crown Prosecutor, Official Receiver, Public Trustee and Assistant Returning Officer. As an architect he was reponsible for the design of Palmerston's most substantial buildings, including extensions to Government House, part of the Police Stationand Courthouse, sections of fannie Bay Gaol, Brown's mart and the Town Hall. The Northern territory Times reported that " we cannot recall anything that created so universal a feeling of sadness as the decease of this honoured and honourable servant of the Crown and friend of the people, whose death marks a blotting out of a noble life and perhaps the grandest 'landmark' the Teritory could point to. The next day flags in Palmerston were at half-mast and public offices and businesses were closedas Knight's funeral cortege moved through the town. European, Chinese and Malays were all mingled together in vehicles, on horseback or walking and even the Aboriginals, realising no doubt the full extent of the many kindnesses shown to them by the deceased, took the opportunity of testifying their gratitude." Click here return from John Knight Memorial to Darwin Cemetery links to History.